I have always enjoyed taking pictures of wall murals. 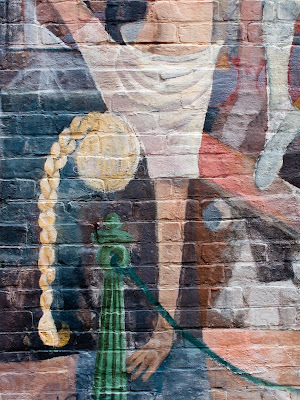 However, I have typically photographed only isolated small abstract portions of the murals. Usually these images have no hint of what the mural was actually a painting of and consist only of abstract splotches of paint that denote only color, tone, and shape. When I was in Montreal about a year ago I saw a mural that I found interesting. However, instead of the usual abstract 'blotches' that I typically would take, I found myself drawn to a portion of the mural that was much larger than usual for me. It reminded me of Alice In Wonderland. A year later I still like it, though I am not quite sure why!